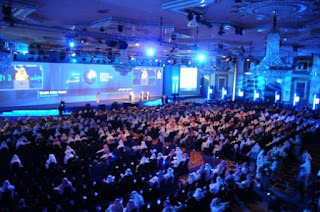 I was in Jeddah in Saudi Arabia this weekend to speak at the Jeddah Economic Forum. 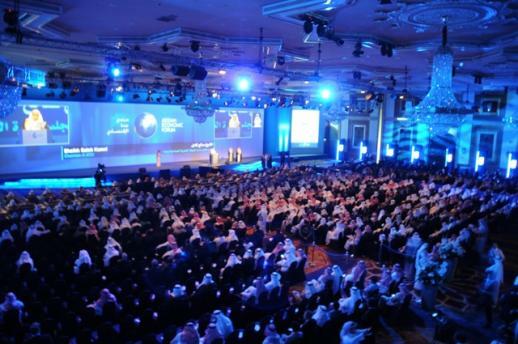 The four day Forum has taken place every year, for the past ten years. Previously it has been addressed by then serving President Mary McAleese of Ireland, and by then former Presidents Giscard d’Estaing of France, Bill Clinton, and George HW Bush of the United States. John Major and Helmut Kohl have also addressed the Forum. This year the former Prime Minister of Pakistan, Shaukat Aziz will speak. Jeddah was founded as a fishing village in 500 B.C. It was incorporated into Saudi Arabia in 1924 after the end of the Ottoman Empire. Today it is the commercial centre of Saudi Arabia and is internationally oriented as it is the gateway, through which Muslims from all over the world pass, on their way to Mecca on pilgrimage. Jeddah is the headquarters of the Islamic Development Bank, and of the International Association of Islamic Banks. It was an important place to visit in promoting Ireland as an international financial services centre. Ireland has passed legislation to facilitate the provision of Islamic finance from an Irish base. Ireland also hopes to attract Saudi investment in renewable energy and other sectors. There is a great deal of construction activity taking place in Jeddah. GLOBALISATION – HOW SHOULD COUNTRIES COOPERATE? I was asked to speak in a session on “Building Blocks-Models of Regional Cooperation”. The European Union is the most advanced model in the world of regional cooperation and there is a lot of interest in Asia in how it works. There is a pervasive scepticism in the English language media about the prospects of success of the European Union. Many of the same people, who predicted that the euro would never even be established in the first place, are now enthusiastically predicting its imminent demise. But events are proving that EU institutions are able to adapt, albeit slowly, to new challenges. I explained how the EU works and spoke of the recovery under way in Europe after the economic crisis. It has, of course, been a difficult process. Only in the last few weeks have adequate mechanisms been put in place to monitor overdue reforms, and to help remove underlying imbalances in the European economy. These things should have been done when the euro was originally launched in 1999. During the down turn, Europe lost market share in export markets. Even Germany has had that experience. If Europe is now to regain its dynamism, it will have to be able to reallocate resources, both human and material, more quickly from sectors where demand is in decline, to ones where it is on the increase. Restrictive practices and unnecessary rules- in entry to the professions, in the setting of wages, in education-inhibit the efficient reallocation of resources, and thus prevent the creation of new jobs. Getting rid of these restrictions is just as important as restoring the state finances. Reports by the European Commission to the heads of EU Governments are beginning to identify these bottlenecks. Passing laws to remove the bottlenecks will be a national responsibility, and vested interests will do their best to slow down progress, as we are seeing in Spain and Italy at the moment. To meet the challenge of the rising, and more youthful, economies of Asia and Latin America, Europe will also have to put greater emphasis on efficient use of all its limited resources. For example much energy is wasted in badly insulated buildings. Only 40% of Europe’s waste is recycled. Huge amounts of food go to waste. Arable Land is being wasted too. An area the size of Cyprus in concreted over for development in Europe every ten years. But the greatest waste of all, is the unemployment of young people. There is something desperately wrong with a situation where, notwithstanding heavy investment in education and free movement of young people from country to country within Europe, youth unemployment is 19% in the UK, 22% in Belgium, 28% in Ireland 30% in Portugal, and 48% in Spain. +the EU is not about to become a transfer union either. Countries in difficulty are being offered interest bearing loans, not subsidies. Once the loans are paid back they will stand on their own feet. +Nor is the EU becoming a fiscal union, because the vast majority of tax and spending decisions will continue to be taken at national level. The new EU rules will simply require that countries balance their books. It will for each to decide whether they want to do that at a high, or a low level ,of spending. Originally , the EU set rules in regard to goods and services, so that these could be freely traded across borders. Then, as people moved from country to country, the EU came to set rules on mutual recognition of qualifications and rights to social security. With the establishment of the euro in 1999, the EU started to implement rules on debts and deficits. Now these rules, which were too weak and imprecise and which were flouted by nearly every country, are being strengthened and made automatic. New norms are being set, on how budgets are presented, on levels of private debt, and on excessive trade surpluses as well as on excessive trade deficits. The aim is to ensure that the EU has a consistent economic policy, which will ensure that sort of difficulties ,which came to a head in 2008, will never again arise. This is an evolutionary process. It involves trial and error.